The fifth and final instalment of the Christmas Snow and Ice CAL is the rose motif. 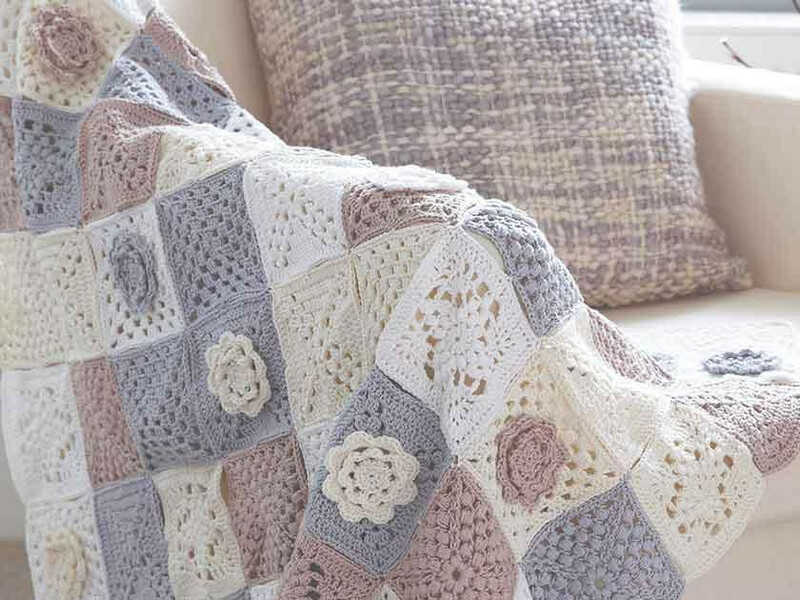 Make these in assorted shades and add to the top of the blanket. For this CAL you will need Sirdar Cotton DK (100% cotton). 2 x 100g (212m) balls of Sirdar Cotton DK (100% cotton) in each of Mill White (501), Vanilla (502), Light Taupe (504) and Grey Dawn (520). You will also need a 3mm hook. If you missed out on the previous patterns then you can download them here. First round: Make a slip ring on your left finger. To do this, wrap yarn around finger. Insert hook into ring, yarn over hook. Work 2 chain (ch), to make ch, take yarn round hook and pull through. Repeat once more so that there are two chains. Work 7 double crochet (dc) into the ring. To do this, insert hook into the ring. Yarn over and pull through. Yarn over again and pull through both loops on hook. Repeat a further 6 times making 7dc in total. Slip stitch (slst) into top of 2ch. To work slst, insert hook into stitch (st), yarn over and pull through all sts on hook. Pull end of yarn tightly to close ring. Work 1dc in base of 2ch. Work 2dc in the next stitch. Repeat working 2dc in each st around. Slst in top of 2ch. Miss the next dc and work 1dc in next dc and 3ch. Repeat a further 6 times making 7 in total. Miss the last dc and slst into first 4ch. Fourth round: Work 1dc, 1 half treble (1htr), 1tr, 1htr and 1dc all in next chain space (chsp). To work htr, take yarn over hook. Inset hook into chsp, yarn over hook again. You will have three loops on the hook. Take yarn over hook and pull through all three sts on hook. Work the rest of the sts into the chsp referring to pattern or the instructions above. Repeat making 8 petals in total. Fifth round: Working behind the petals, slst into 2 strands at base of each of first 3 sts on first petal. Yarn over and pull through all sts on hook. And then slst into 2 strands at base of tr on next petal. Repeat the 3ch, slst into 2 strands at base of tr on next petal a further 6 times, so all of the round has been worked. Referring to pattern, join with a slst. Work 1dc, 1htr, 3tr, 1htr and 1dc all in next chsp. Continue working the sts into the chsp. Once all the 8 petals have been worked, slst into 1ch that you worked at the start. Fasten off and weave in the ends. That's your rose complete. Make 9 in total in a mix of the shades given. Attach to the top of the blanket after joining the squares together referring to pattern. Scatter the roses randomly across the blanket in the centre of the squares. That's your Snow And Ice CAL blanket complete! We would love to see your finished blankets so please share pictures of them over on The Knitting Network Facebook page.